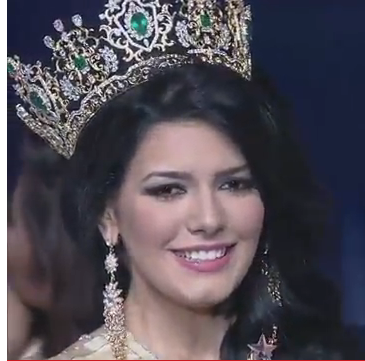 Miss Puerto Rico, Janelee Chaparro was named the first ever Miss Grand International in Bangkok earlier tonight. The 22 year old beauty wins US$30,000 in cash and will live in a luxury Bangkok apartment during the year of her reign. As Miss Grand International she will be a spokeswoman for anti-war campaigns. The first runner-up was Miss Dominican Republic while Miss Slovak Republic finished as the second runner-up. Miss Philippines was named the third runner-up and Miss Australia was the fourth runner-up. The delegates from Brazil, Cuba, Latvia, Venezuela, and Sri Lanka completed the top 10. Misses Macedonia, China, Netherlands, Pakistan, USA, Thailand, Myanmar, Ecuador, Zimbabwe, and Colombia made it to the top 20. China won Best National Costume, Latvia won Best in Swimsuit, Dominican Republic won Best in Evening Gown and Myanmar won the Popular Vote Award. Miss Grand International, Puerto Rico's Janelee Chaparro with her court, Miss Philippines (4th) Miss Dominican Republic (2nd), Miss Slovak Republic (3rd), and Miss Australia (5th). Good results but I was rooting for Dominican Republic to win. Overall, a GREAT start for this pageant. I am very impressed. They production was much better than Miss International and Miss Earth's productions and I dare even say almost better than Miss World's.